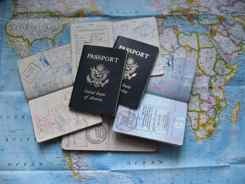 With e-tickets and online reservations, do you need a travel document checklist? There are some paper documents you just can't get away from. Your passport for one thing. Or your driver's license if you are traveling domestically or driving anywhere on your trip. Or some sort of "acceptable identification document". When you travel, you are responsible for having these documents. Airline personnel will require proof of your identification, and for foreign travel, your valid passport. Without them, you won't be going. TAKE THE DOCUMENTS WITH YOU! But I can't tell you how many stories we've heard about travelers saying, "I left my passport on the table at home. I've got one. I just don't have it with me." If you don't have your passport or acceptable identification document with you... you're not going. There are other documents you should make sure you get... or print and take with you. _____Visas... Many countries require that you obtain a visa before you enter the country. This may be physically stamped in your passport or in some cases done electronically. If you get your visa electronically (Australia, for one, does it this way) print out the confirmation so you have proof of receiving it. Either way, it's your responsibility to have a visa if it's required. If your tour company is getting "visa clearances" for you, take your documentation to prove that. This was the documentation we had to provide when we entered Bhutan. _____Paper Tickets... Most airline tickets are e-tickets, but paper tickets still exist. You may have paper airline tickets if you are traveling on multiple carriers or if you're traveling on small airlines to out of the way places. You must take them with you. _____Confirmation Numbers... If you've made your reservations online, it's a good idea to print out your confirmation number and take it with you. Be sure you put the correct dates in and that you actually hit the purchase button. People goof up on this all the time. Having confirmation documentation will help straighten things out if you can't find your reservation at the ticket kiosk or at the hotel desk. This applies for airline flights, hotel reservations, tours, rental cars, even ferries and trains. _____Itinerary... A paper copy of your itinerary will let you make sure you are getting what you want and what you paid for. Documentation will help make sure that transfers from one tour company to another can be straightened out if all doesn't go according to plan. _____Vouchers.... If you're taking a tour, you may receive vouchers in the mail for hotels, transfers and different parts of the tour. Take them with you. Check with your tour company to see if they issue vouchers. Some do and some don't. Some will have a representative meet you at your destination with your vouchers. Vouchers are not usually issued with big groups.... they tend to be issued for small independent tours you set up for yourself. _____Contact Numbers... Make sure you have local phone numbers for contacts or tour agencies you're using. Interestingly, even in remote areas, the guides will probably have mobile phones so you can contact someone if something goes wrong. _____Photo Copies... Make good photo copies of your passport. Leave a copy with friends or relatives and keep one with you in a secure place. If you ever lose your passport or have it stolen, this will make it much easier to replace. _____Extra Passport Photos... Take extra passport size photos. If you need to apply for a visa upon entry, you may need one or two. Extra photos are always good to have. _____Emergency Numbers.... Take a list of emergency phone numbers and numbers to call if your credit cards are stolen. This checklist may not be complete. Use it as a basis to make up your own. You may have to gather and take a few more documents with you especially if you're dealing with more than one agency as we did when we went to Bhutan and China. Or when we did a Kenyan safari then went to Gombe National Park in Tanzania to see Chimps with a different agency making the arrangements. The more complicated your itinerary, the more you need a travel document checklist! If you're planning a complicated itinerary on your own, or if you're just taking a simple getaway, a travel document checklist will keep you from forgetting something and having your holiday derailed.